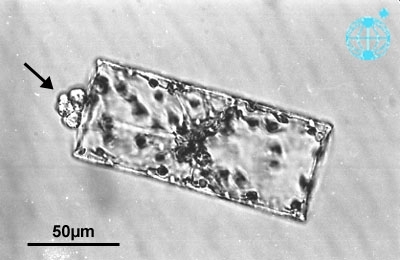 caption The parasitoid nanoflagellate Pirsonia (arrow) on Guinardia sp.. First day in culture at 15Â°C. Originally sampled at the Hafenmole/List on the 6th of September 1990. Up to 8 Auxosomes without flagellum. (See also observation 1540 and 1541.) This image is part of the collection of Dr. Gerhard Drebes.